Summary: If you are planning for an evening outing in Vijayawada when you are staying in a hotel at the main city, the place to visit is the Rajiv Gandhi Park. 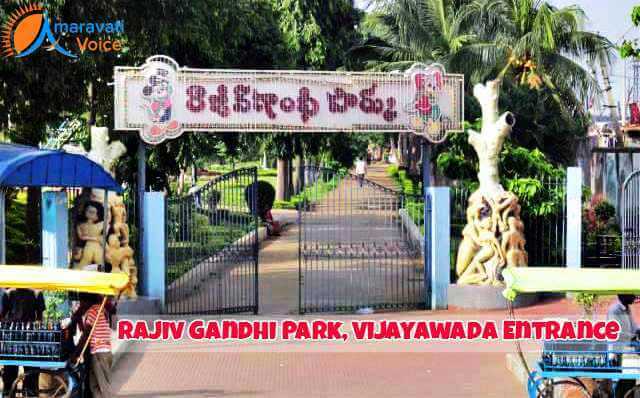 The first and foremost attraction that would have attracted your mind when you entered Vijayawada is Rajiv Gandhi Park, isn’t? Yes, the park stands tall right as the entry point of the city and offers a warm welcome to the tourists. 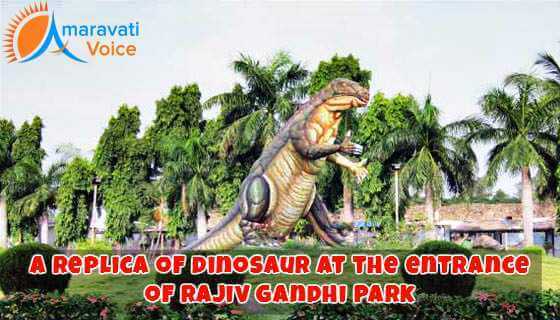 This park developed by the Municipal Corporation of Vijayawada is an important attraction for the visitors. If you are staying in Vijayawada for covering all the attractions in and around this city and look for a place to spend some valuable time along with your family after having spent a long day of outing, Rajiv Gandhi Park is the right place to visit. With an entry ticket of just Rs.3 for adults and Rs.2 for children and with the timings of the park between 2pm and 9pm on weekdays and 2pm to 9pm during Saturdays and Sundays, your entire family, particularly, your kids are sure to enjoy this place. As it stands as the entry point of the city, the park is maintained well and looks green relieving all your stresses with the attractive number of trees. The water fountain is lit at nights and it is a musical fountain as well. You will surely be excited to see the fountain dancing to the rhythm of music and this fountain is operated every day from 7.30 pm to 8.15 pm. But, do not plan your visit during Mondays as the fountain is not functional on this day of the week. You can have a pleasant walk on the walking lawn with your partner sharing your early life memories, while will kids will enjoy playing with a number of kids, who gather at this spot every day. Not just as a playing ground and musical water fountain, your kid will feel happy about meeting her animal friends. Yes, there is a mini zoo in the park. Do you think there are just animals alone? No, in addition to park for playing, there is also a park for educational purpose as well in this destination. Your kid will be enthralled to see the massive replicas of dinosaurs and many other extinct prehistoric animal-replicas. Your family will enjoy viewing these attractions with a little bit of snacking, isn’t? To quench the hunger of your children, there are food and drink stalls with quality snacks and even you can find food items for kids in these stalls. The park is named after the former Prime Minister of the country to honour his contributions to the society. This is the right place to plan your visit, particularly during summer, when you take your kids to Vijayawada to spend their vacation. When you have chosen a place to stay close to the main junction of Vijayawada, you can just make an evening walk to park and can get rejuvenation to your body and mind.